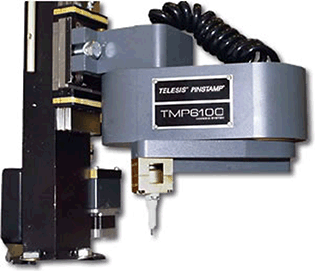 The TMP6100EAS is a special electric pin configuration of the versatile TMP6100 PINSTAMP® marking head, specifically developed for 2-D code applications. It is easily integrated into either on or off-line applications and includes an electromagnetic marking pin and an AUTOSENSE motorized Z-Axis mounting post that ensures a consistent pin stroke for highly repeatable 2-D cell sizes. No operator intervention is required – pattern specific standoff setting ensures that the critical standoff distance is consistently repeated -- A great tool for multiple plane marking. 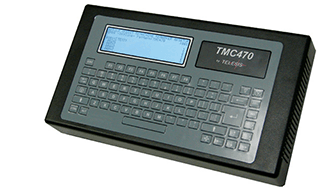 Since the marking pin can be positioned anywhere in the generous 6" x 12" (152mm x 304mm) marking window, the TMP6100EAS can mark any character height, style or number of lines desired. Its robotic design allows clear access to the marking window for loading and unloading of parts.